A Michigan Rep. says that his staff was not allowed to attend. camera (Kristoffer Tripplaar/Sipa USA via AP Photo) A logo sign outside of the headquarters of the United States Environmental Protection Agency (EPA) in downtown Washington, April 2, 2017. The Environmental Protection Agency was under fire from news organizations for a second straight day Wednesday for blocking some reporters from attending a summit on a chemical found in drinking water systems around the country. Reporters for CNN, Politico, and a third news organization said they were not allowed into the EPA headquarters Wednesday to cover a second day of the summit. An EPA spokesman said Wednesday's session was not the kind of meeting required to be open to the public. A congressman from Michigan, Rep. Dan Kildee who represents Flint and another town dealing with contaminated water, also said that a member of his staff was not allowed to attend the summit on Wednesday, when an EPA official said the goal was a "government-to-government" discussion. Kildee wrote to the EPA's inspector general on Thursday asking for an investigation into whether the EPA violated any laws requiring government meetings to be public. At the beginning of the event on Tuesday, reporters from the Associated Press, CNN, and an outlet that covers energy and the environment matters called E&E News tweeted that EPA security would not allow them into the event for the morning sessions. Some of the reporters in the room at the beginning of the event were from CBS News, The Hill, Politico, and Bloomberg Environment. On Tuesday, the EPA initially said that there was not enough space at the event for all the reporters that tried to get in but later said journalists would be allowed to attend the afternoon sessions. Multiple reporters tweeted that they were turned away on the second day of the summit on a type of chemical found in drinking water around the country. About 200 state and local officials and leaders from Native American tribes met at the summit on PFAS chemicals that have contaminated drinking water and soil in various sites around the country. Administrator Scott Pruitt and other officials spoke at the opening of the summit on Tuesday, part of which was streamed live on the EPA's website and had some reporters in attendance. But reporters tweeted that they were asked to leave when the summit moved into working sessions and panels with agency officials and experts for the remainder of the day Tuesday and on Wednesday reporters said they were not allowed in to cover discussion sessions on the topic. The summit attracted additional attention after Politico published emails showing that federal officials sought to delay a study into the level of the PFAS chemical that is safe. Pruitt has said that he wants that study released but the agencies have not announced when it will be made public. One reporter even posted Wednesday that she was standing outside EPA headquarters to interview state and tribal leaders attending the summit. On Tuesday, the Associated Press reported that a security guard "grabbed (an AP reporter) by the shoulders and shoved her forcibly out of the EPA building" when she asked to speak to a member of the agency’s public affairs staff about being allowed into the event, none of whom were involved in that incident. Reporters and editors criticized the EPA on Twitter for physically grabbing the reporter and only allowing some news organizations access to the event.
.@CorbinHiar and I were just turned away from day 2 of the @EPA #PFAS summit that made headlines yesterday after an @AP reporter was ejected. Both security and @EPA staff were very cordial. Still, I don’t understand why the event is closed to the press. This morning's PFAS Leadership Summit at @EPA headquarters is open to the press... just not to reporters from @EENewsUpdates, @AP or @CNN. We've all asked the agency's press office why we're being selectively shut out and have gotten no responses. An agency spokesman said in a statement Tuesday that some reporters were not allowed into the first day of the event on Tuesday because space was limited. “This was simply an issue of the room reaching capacity, which reporters were aware of prior to the event. 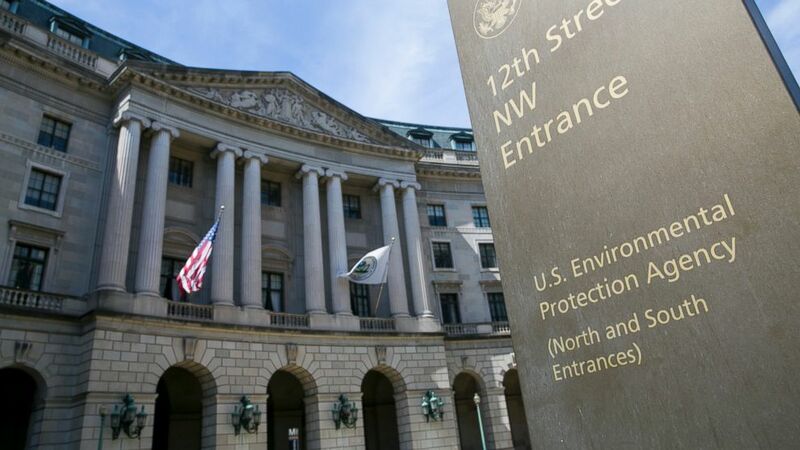 We were able to accommodate 10 reporters and provided a live stream for those we could not accommodate,” EPA spokesman Jahan Wilcox said in a statement. Wilcox said in another statement on Wednesday that the summit was not a federal advisory committee event. "The purpose of this event is for EPA’s state, tribal, and federal government partners and national organizations to share a range of individual perspectives on the Agency’s actions to date and path forward on PFOA/PFAS. The Agency looks forward to hearing from all stakeholders on these crucial issues,” he said in a statement. Another EPA official said in a statement Wednesday that officials had the expectation that the second day of the summit would be a "government-to-government discussion." Federal law sets transparency requirements for meetings of committees intended to advise agencies on policy decisions. That law, the Federal Advisory Committee Act, defines committees as "Any committee, board, commission, council, conference, panel, task force, or other similar group" meant to give advice or recommendations to the president or a cabinet-level agency. The law says that meetings should be open to the public and that agencies must keep detailed and accurate records of what is discussed. "Journalists need to be able to attend meetings like this one in order to report firsthand on what the government is doing. Selectively barring reporters from certain news organizations from attending a national summit on an important public health issue is not acceptable," legal director for the Reporters Committee for the Freedom of the Press Katie Townsend said in a statement. A reporter for The Hill that attended the event reported that a handful of seats set aside for media were empty. AP executive editor Sally Buzbee said in a statement that the EPA’s actions were alarming. The EPA later said that the afternoon sessions of the summit would be open to reporters. An ABC News reporter attended one of the sessions. A CNN spokeswoman said in a statement that the organization was selectively excluded from the event. “Today, CNN was turned away from covering the PFAS National Leadership Summit at the EPA after multiple attempts to attend. While several news organizations were permitted, the EPA selectively excluded CNN and other media outlets. We understand the importance of an open and free press and we hope the EPA does, too,” the spokesperson said in a statement. White House press secretary Sarah Sanders said in Tuesday's briefing that the White House would look into the incident during the summit. EPA has been criticized by some media outlets for a lack of transparency and its approach to reporters. In one instance the agency called out an Associated Press reporter by name in a press release, calling him biased for a story about flooding at contaminated sites after Hurricane Harvey. saying that he was "reporting from the comforts of Washington" in a press release, had previously fabricated information, and that a story about flooding at contaminated sites after Hurricane Harvey was inaccurate and created panic. The AP story in question had two reporters on the byline, one based in Washington and one based in Texas, and reported that EPA officials were not on scene at contaminated sites that flooded after the hurricane. The EPA said at the time that some of the sites were not accessible but that they were being monitored. The professional organization for environmental journalists previously wrote to the EPA calling for more transparency and better treatment of reporters who cover the agency. The Committee for the Protection of Journalists, which advocates for freedom of the press, said in a statement that while the public should be careful to speculate about a single event, reporters have raised concern about "increased hostility" from the EPA and wrote to Pruitt again Wednesday objecting that reporters were excluded from the event. "It's disappointing that the officials blocked journalists from covering a summit on water contamination at the EPA's headquarters today and that one reporter was forcibly removed. The EPA should ensure that events in the public interest can be widely attended by the media. Providing only ten spaces for journalists- and barring major media outlets at the entry- does not send a good message, CPJ North America program coordinator Alexandra Ellerbeck said in a statement. Sen. Tom Udall, D-N.M., and the ranking Democrat on a committee with oversight of EPA, said in a letter to Pruitt that he should apologize for the way the journalists were treated.